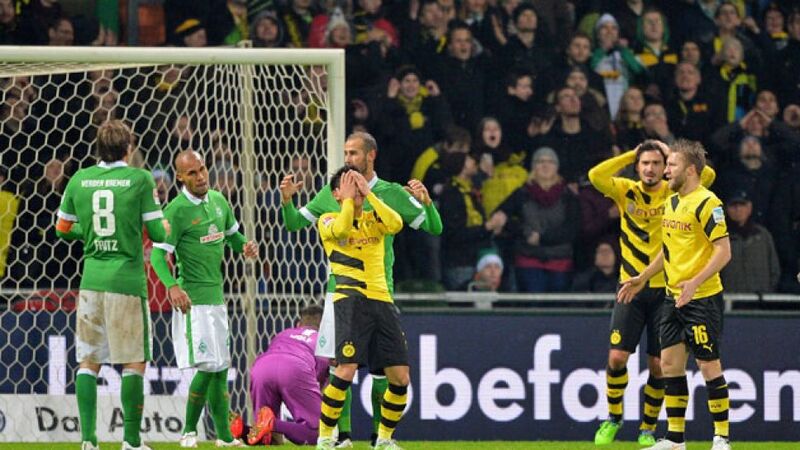 Cologne - When was the last time Borussia Dortmund endured such a terrible first half of the season? Which was the latest Bundesliga record to fall to the mighty FC Bayern München? And which club records have VfL Wolfsburg been breaking? 5 - For the fifth time in Bundesliga history, a team has gone the first half of the season unbeaten. With 14 wins and three draws, Bayern achieved the feat for the third time, with Hamburg in 1982/83 and Leverkusen in 2009/10 also going without defeat. 34 - Wolfsburg have never before picked up so many points in the first half of a season, not even when they won the Bundesliga title in 2008/09. 6 - For the sixth time this season on Matchday 17, SC Freiburg threw away a lead, also conceding an equaliser after the 85th-minute for the fifth time. Just like against Hoffenheim on Matchday 5, they let slip a two-goal advantage against Hannover 96 in 2014's final fixture. 15 - With just 15 points, Dortmund have completed their worst Hinrunde since 1987/88. 27 - With 27 points, FC Augsburg have set a new club record after 17 games. Never before have they racked up so many points at this stage of a season. 34 - Elkin Soto's goal for 1, FSV Mainz 05 against Bayern was only the second time the Bavarians have gone behind this season. The strike also made the 34-year-old Colombian the oldest goalscorer in his club's Bundesliga history. 350 - Sebastian Kehl's 350th game for Borussia Dortmund didn't quite go according to plan, as his side slipped to a 2-1 defeat to SV Werder Bremen. 4 - For the fourth time this season, Köln lost despite taking a 1-0 lead - that's twice as many times as any other team.